This information is provided by Babasails. Please confirm all details direct with them prior to booking. Yachting Limited neither endorses Babasails nor guarantees the accuracy of this listing. We are happy to invite you to an unforgettable cruise with BabaSails Yachting! Our luxurious yachts will cover all your needs and provide all the comforts. Our specialized stuff and captains will offer you the best of service and warm Greek hospitality. Our cruises are highly recommended if you want to avoid overcrowded places. Escape with us, discover isolated places and explore enchanting beaches with turquoise waters! Relax on the yacht's board and feel the unique sensation of sailing or the masculinity of a speed power boat! On one of our three-day cruises you will have the opportunity to marvel at the monasteries of the west side of Mount Athos as well as depart at the city of Ouranoupolis. Open your sails with us and set bow to an unforgettable experience! The details of the yachts below are indicative. 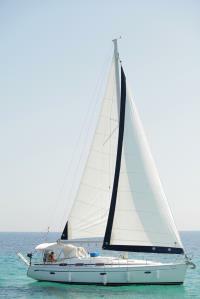 The specifications (including the number of berths, cabins and heads) of Babasails's yachts may vary. Please confirm the details with Babasails. There are no user reviews for Babasails yet. Be the first to add a review.